This Show Dog site is owned by BLUgenesYorkshire Terriers. 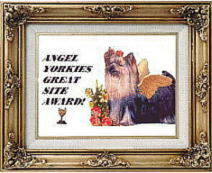 This Camelot Yorkies Web Ring site owned by BLUgenes Yorkshire Terriers. Camelot Yorkies Web Ring ver. 1.1!